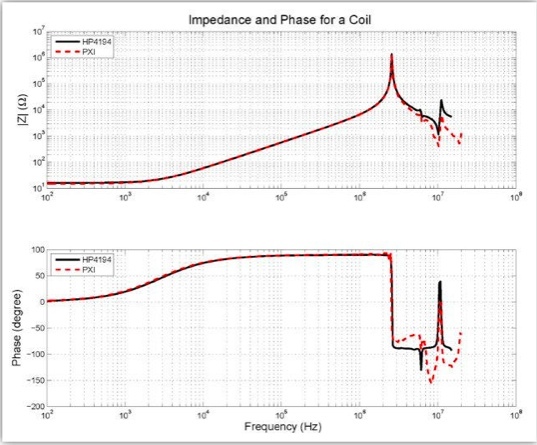 Impedance measurements are needed in many different industries for communications or other characterization purposes. These uses span from design validation in R&D though testing components following manufacturing. The marketplace for instrumentation to perform low frequency (<10MHz) impedance measurements at an efficient price point has become increasingly void over the last decade as equipment providers continue to place additional focus on high-frequency RF systems. National Instruments has worked with its customers to develop a solution leveraging PXI modular instruments and graphical LabVIEW software to create a system that can perform impedance analysis with very small inaccuracies from frequencies of 100 Hz through 8MHz. In the current design, optimal impedance measurements are made when the DUT impedance is close to the R3 resistor value giving results with less than 1% error. This circuit and software allows for cable compensation using an open, a short and a known resistor measurements to reduce or eliminate the test cable impedance from the DUT measurement. The location of R3 and its influence in this configuration is depicted in the circuit diagram below. The source code of this specific application is provided with this article ‘As Is’, and are not supported for further modifications by National Instruments. In order to open and run this software, LabVIEW 2010 or newer is required and the NI-SCOPE, NI-FGEN, and NI-DCPOWER drivers are required along with the corresponding hardware devices. The implementation includes a state machine architecture that allows for excitation to be provided to the active amplifier circuit (external interface circuit), the function generation to provide the swept stimulus signal, measurements to be made simultaneously on the digitizer, and analysis and calculations to be made of the measured data. Previously to conducting an accurate measurement, an Open, Short, Reference/Load calibration is necessary to compensate for the cabling and internal system circuitry. Using available information regarding four-point network compensation throughout the paragraphs below, the equations and resultant calculations are implemented in the LabVIEW application. A, B, C, and D (shown in Figure B-1.) This circuit model is basically same as that used in open/short/load compensation. Note: These parameters are complex values which have real and imaginary components.